K8008 Darth Vader/Stormtrooper Kit is a Star Wars Product Collection set released in 2002. It contains the sets 8008 TECHNIC Stormtrooper and 8010 TECHNIC Darth Vader. 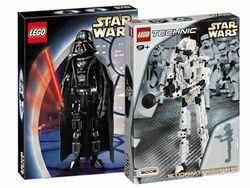 Facts about "K8008 Darth Vader/Stormtrooper Kit"
This page was last edited on 17 August 2017, at 02:11.